Hagia Sofya should be a mosque again? Oh Turkey, but I guess it's the same for many nations where political wrangling upsets the market place while the everyday bod in the street gets by one way or another. Why should anyone be surprised? This is where East meets West; where cultures mix, clash and collaborate. This is a country where secular principles were laid down to help manage those clashes and collaborations; not easy within today's level of the world human psyche. This is a country where a political party is free to declare a proposal that Hagia Sofya be returned to the status of a working mosque; whose cultural capital Istanbul is still called Constantinople by Greeks. No doubt there may be deep lingering feelings of many kinds in Georgia, Armenia, Iran, Iraq, Syria and Bulgaria. That's 7 countries bordering Turkiye, let alone the EU, the USA, Asia and beyond. No wonder Turkey so often gets a bad press. And there is Ataturk, the man who tried to seperate religion from politics. Do either the USA or Iran want that? Well, at least in Istanbul, this yabanci (foreigner) feels free to believe in whatever he chooses. "Paintin's like football - you gotta score! Score a goal like scoring a sale at the right price. That keeps all the punters happy and allows my business to be creative. When we're creative, people get employed and paid. All the punters like a good score. Whatever I feel about the creative process, it is like religion - it's my business! Not yours, not the next door neighbour's, not the Pope's nor Bush, Blair, Godfathers, Bishops, Imans, Vicars nor Mahmoud Ahmadinejad in Iran or Castro in Cuba. If I have profound spiritual experiences or if I feel nothing at all - it's my business! The secular constitution alows me at least that freedom - it leaves your personal business as your own and private business. " 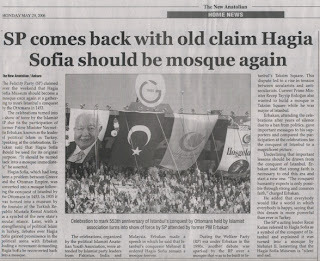 It is interesting to note that the man calling for Hagia Sofya to be returned to mosque status was former Turkish Prime Minister Necmettin Erbakan. He was recently found guilty of embezzling state funds and sentenced to prison. A recent proposal has been voiced within Turkish political circles to abolish the immunity of members of parliament with regard to corruption, yet the proposal has been either sidelined or denied by the current ruling body. The current government changed the law to allow Erbakan to serve his prison sentence at home; old age and ill health cited as the justifications. The former PM was healthy enough and at liberty to give a public speech over the past weekend. During the 1990’s when Erbakan came to power, he also generated debate regarding the building of a mosque in Taksim Square. This proposal was also supported by current PM Recep Tayyip Erdogan while he was Mayor of Istanbul. We love Hagia Sofya at WEMW; or Sofi, as NPP refer to her. If the Muslim makes her a mosque, then maybe the Christian will consider reclaiming her for Byzantine times gone by and where will it all stop? Surely a museum has been an excellent solution where all races and religions can visit and marvel at one of the wonders of the world. Sofi? She's beautiful just as she is!